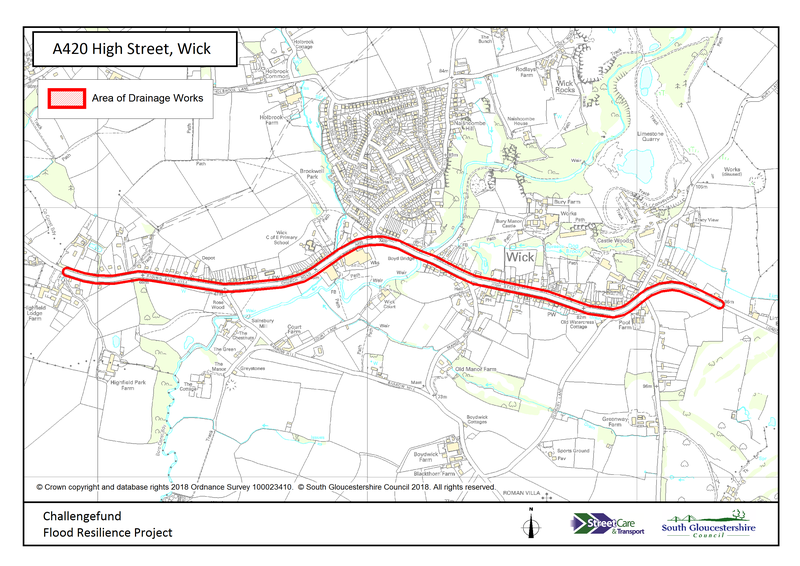 We are due to start work on drainage improvements on the A420 High Street, Wick on Monday 18 February 2019. We will be working on the A420 between the junctions with Manor Road and Court Road. This work will take up to six months to complete. We will be undertaking the majority of the work using temporary traffic signals, however, we may need to close the road for limited periods. We will do everything we can to keep any road closures to a minimum. Access for residents and businesses in the High Street will be maintained during any closure period and a signed diversion route will be in place. Staff will be on site to offer advice and assistance. The A420 Wick was selected as one of nine sites across South Gloucestershire as part of a wider £3.35million Government funded scheme to improve drainage and flood protection systems. Whilst our CCTV surveys revealed significant damage, we may find further defects as we begin work on site. It is therefore difficult to provide an accurate timescale of the works but we anticipate it will take a minimum of six months. We will provide updates for residents as we begin work on site. To stay up to date with the project, you can also subscribe to our regular newsletter. We will update you on the progress of the works but if you have any queries please email the project team FloodResilienceProject@southglos.gov.uk or call us on 01454 868000.